Home » Law Life » WIAW–Breakfast and Dinner Recipes! Happy Wednesday! So today is the very first Wednesday in a long time that I totally forgot about What I ate Wednesday! Yesterday I went on a 4 mile run and then to Jazzercise with my mom, so I didn’t actually end up eating breakfast until 11:30, so I never really had lunch! So for today’s WIAW, I’ll be giving you the recipes for my breakfast and dinner from yesterday! If you’ve never heard of WIAW, go check it out on Peas and Crayons! When I went to buy my protein powder here in Kansas City, they only had chocolate! 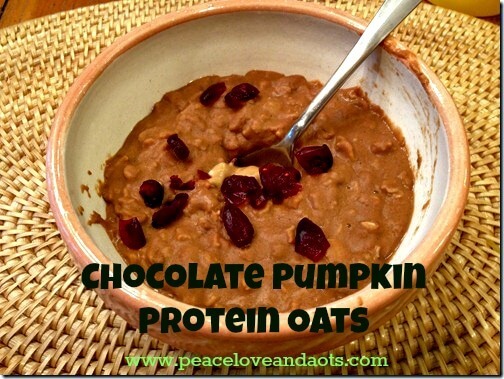 So I bought that and now I have a new recipe: Chocolate Pumpkin Protein Oats! dried cranberries and peanut butter to top! Combine oats, water and almond milk in sauce pan and bring to a low boil/simmer. Mix in pumpkin and cinnamon and cook for a bit. Add 1 scoop protein powder (may need to add more water to keep it from getting too thick. Cook until it reaches the consistency you like (it will thicken up a bit after you pour it into a bowl). Serve and top with PB and cranberries! For dinner, my mom was going to make her normal spaghetti, but with gluten free pasta. However, we realized the sauce mix she uses has soy in it, so I offered to make a new sauce! My mom was in charge of cooking the pasta (we found a brown rice pasta) and cooking the ground turkey. I sautéed some chopped zucchini, yellow squash, and mushrooms and 4 chopped cloves of garlic and 2 teaspoons of olive oil. I then combined 1/2 can tomato paste with 1 can of whole, peeled tomatoes in the food processor, and then poured it over the top of the veggies once they’d cooked down a bit. After that, I added about 1/4 cup chopped parsley, 1 tsp salt, 1 tsp black pepper, and 1 and 1/2 tsp ground oregano. We then added the ground turkey into the sauce and let it simmer for about 15 minutes. Serve the sauce over your pasta of choice and top with parmesan cheese! Do you like my mother’s bowl? She told me to make sure I got the bowl in the picture. She has a set of these that are different colors with different types of pasta written on them. She quite likes them. Everyone loved the sauce and liked it better than what my mom used to make! Personally, I think it was all the added veggies. We are big fans of mushrooms over here. Do you like to re-vamp old family recipes? Who Are Hollywood’s Top Legal Dealmakers?